7 Interested in joining the project? It seems to be customary to mention in every update how the bug-removal process is going, so here is the bug update. Fortunately, in the past 2 months, only a few new bugs have been discovered, while a large handful of them have been resolved. We haven't encountered too many nasty bugs so far, which is a good thing, of course. We promise to make this game as bug-free as possible, and we are making our way towards that goal. I'm sure that many of you remember the view of the town in Mordor 1: two simple rows of pictures that you could click on in order to access different parts of the town. We have improved on this simple setting drastically in MXP. The city is now filled with buildings instead of pictures, and you can click on the buildings to access the services the city has to offer. We have already created the design, but we are contemplating changing it to a different view for resolution purposes. In addition to this change, clicking on each building (for example, the Bank of Dejenol) brings up a screen with a picture of the inside of the building. Simply to help 'spruce' up the game, we decided to change the current main menu since it was so dull. Our members have proposed several changes to the menu, including a version where the menu is in the shape of a castle. This seems to be the favorite idea proposed so far, but we have not made a definite decision yet, so suggestions are always welcome. The dungeon screen layout is slightly different from the layout in Mordor 1. With the fixed interface, it is now larger, which provides more room for the dungeon itself to be seen, as well as more room for the monster groups to be viewed. It is possible that some of the menus will be moved around in the future to provide for maximum viewing, but the interface has been set for now. Here is a screenshot of the dungeon view, which also allows you to view one of the dungeon textures that has been created, along with the (new) picture of a strangleweed. A handy helplesson is in-progress and will be helpful to both new and old players. 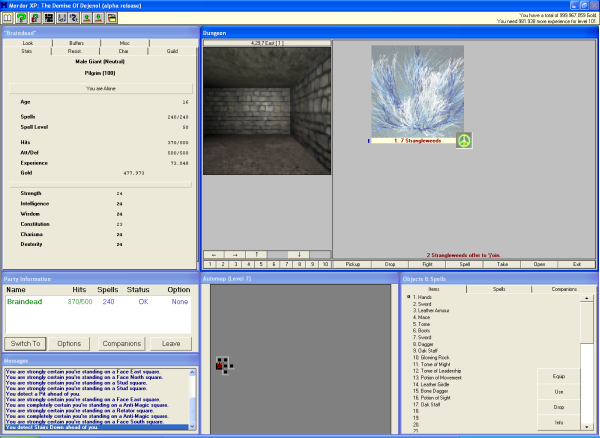 In it, you will be able to find information regarding the new features and changes available in MXP, as well as the original features from Mordor 1. The helplesson includes information pertaining to the town, the dungeon, the guilds, spells, equipment, and other features of the game. For example, each guild has a brief description that mentions their abilities and a list of the spells that they can cast. The stats needed to join each guild are listed as well. Make sure to use the helplesson during character creation. In addition to the new home page for Braindead's Mordor Forums, there is a section for information about Mordor XP. In it, you can find all of the bi-monthly updates, some screenshots, and a list of the development team (along with each member's roles). We will update the site with more information with each new bi-monthly update. We are always looking for talented people to join our quest, check the Mordor XP: Recruiting page for details!